Hi, remember me? There has been a lot of life happening round here which has meant that posting recipes on my blog has not been my priority. Mostly school related stuff, particularly a 5 day field trip away from my family and preparing for the Education Review Office visiting. I realised last weekend that I had spent 19 out of 21 days working, but luckily I am not going anywhere near school or anything related to it during our current long weekend! We also had a serious flood in Kapiti in which many people’s properties were damaged, our street became a lake and our garage was flooded. Nothing of ours was damaged, but my husband had to spend a day battling the elements and moving stuff to ensure that all our things were kept safe! And our house renovations are almost finished after about 3 months – yay!! 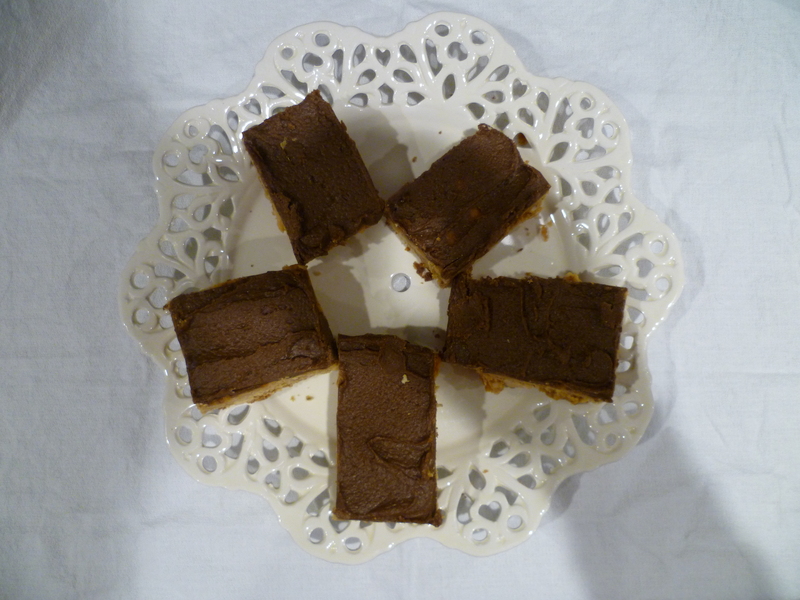 Today we had our monthly crafternoon tea – 2 and a half hours of gossip, tea, treats and crafting which is always a pleasure I made this slice, which is an old favourite from my childhood, and someone asked for the recipe so I remembered I have a blog I can put it on! 1.Turn the oven to 180 C and grease a 20cm x 30cm baking tray. 2. Melt the butter, brown sugar, honey and peanut butter together. 3. Mix all the dry ingredients together and then stir through the butter mix. 4. Press into the greased dish and bake for around 20 minutes. 5. When cool ice with chocolate icing and slice. 1. Heat oven to about 170 C fanbake. 2. Fill an oven dish about 2 – 3cms full with rolled oats. Sprinkle over some coconut. 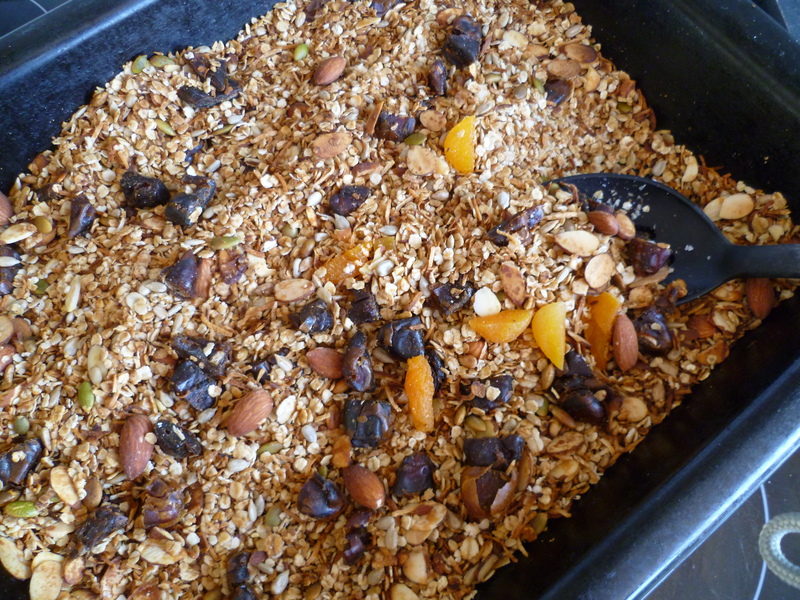 Add some nuts and seeds – pumpkin seeds, sunflower seeds, almonds, brazil nuts and hazelnuts are all good. Toss together. 3. Mix together 2 heaped tablespoons of coconut oil, 1 T honey and 1 T real maple syrup in a bowl or pot. Melt in the microwave or over the oven. Toss through the oats mixture. 5. Cook for about 10 mins, stir. Then cook for another couple of 5 minute bursts, stirring in between. 6. Serve with whatever you fancy – my favourite at the moment is feijoas and yoghurt! These little meatballs are delicious served on their own or in a pita bread pocket or wrap. 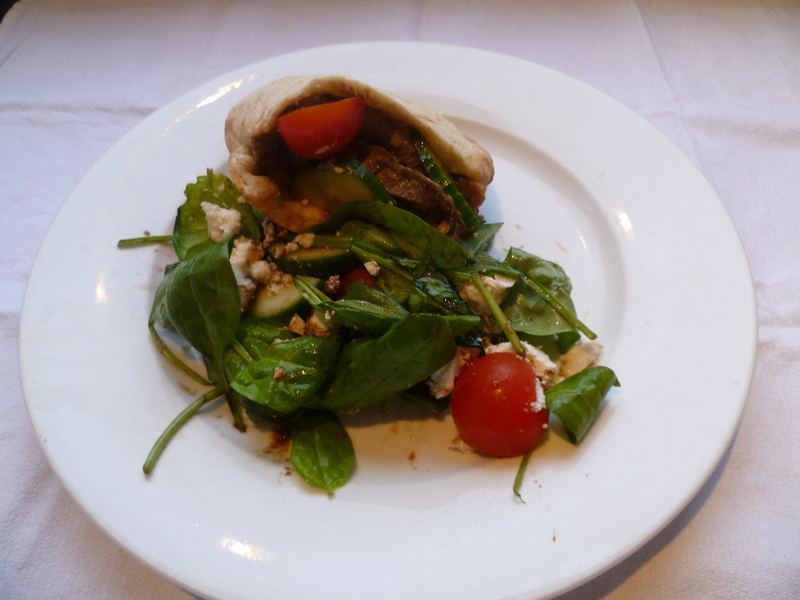 I served ours with a salad made of couscous which is very easy and quick to prepare. 1. Place the couscous in a pot and cover in boiling water. Put the lid on and leave to stand for 10 mins. 2. While it is standing prepare the kofta mix. Make breadcrumbs from the bread in the food processor. Add the remaining ingredients and pulse to mix. 3. Once the couscous is ready fluff it up with a fork. Place in a salad bowl and mix through the olive oil, lemon juice and garlic. Place in the fridge to cool. 4. Prepare the hummus and yoghurt sauce by mixing everything together in a bowl. 5. Heat the 2 T oil in a frying pan. Make small patties from the kofta mixture and brown on both sides. Place on a plate covered in paper towels to soak up any extra fat and oil. 6. While the kofta are cooking finish the salad. Add the remaining ingredients and toss together. 7. Toast the pita breads in the toaster. Spread with hummus and chop into segments. 8. 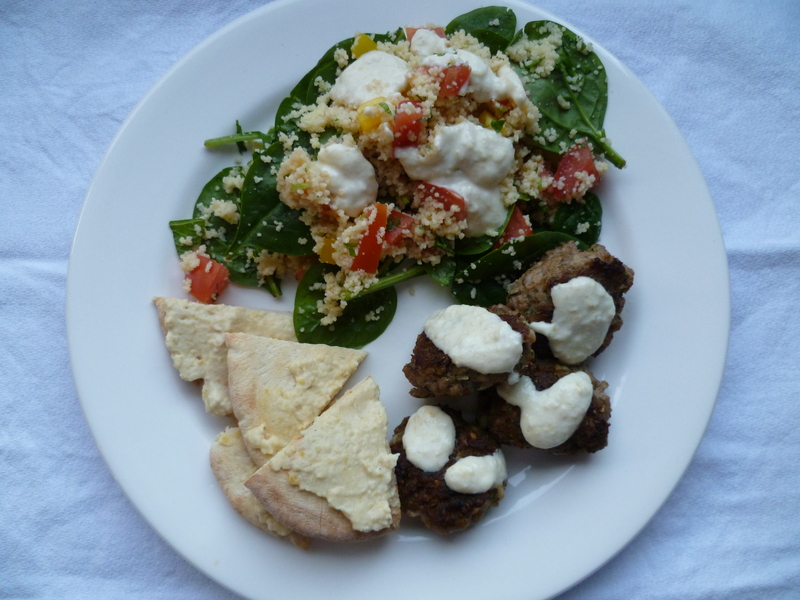 Serve the meatballs and salad with the hummus and yoghurt sauce drizzled on top, and some pita bread on the side. This photo doesn’t really do justice to how easy and tasty these parcels are. I have been making versions of this since BK (before kids), for a while made with smoked chicken and pine nuts it was my go to dinner party recipe. Don’t have time for dinner parties these days! This recipe makes 3 HUGE parcels. One is more than enough for a very hungry man, I can only eat half of one and the girls about a quarter. 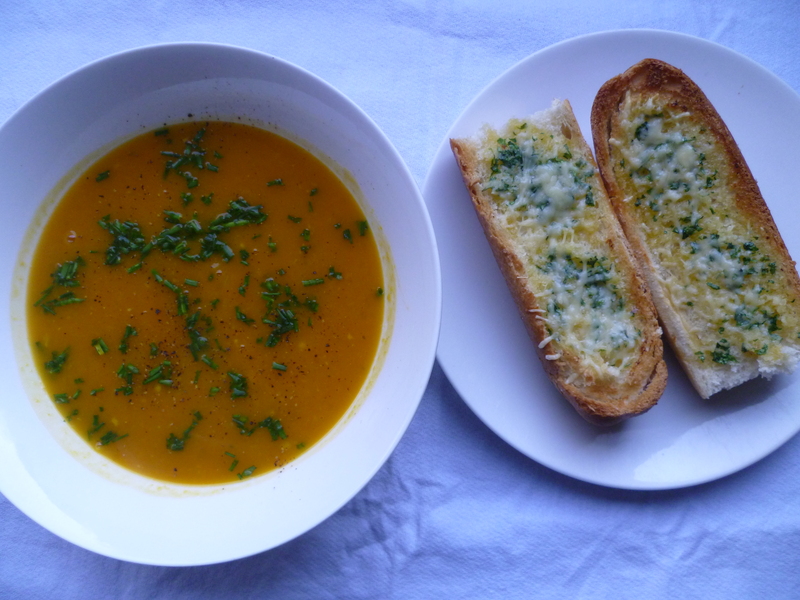 Serve with salad or steamed veges. 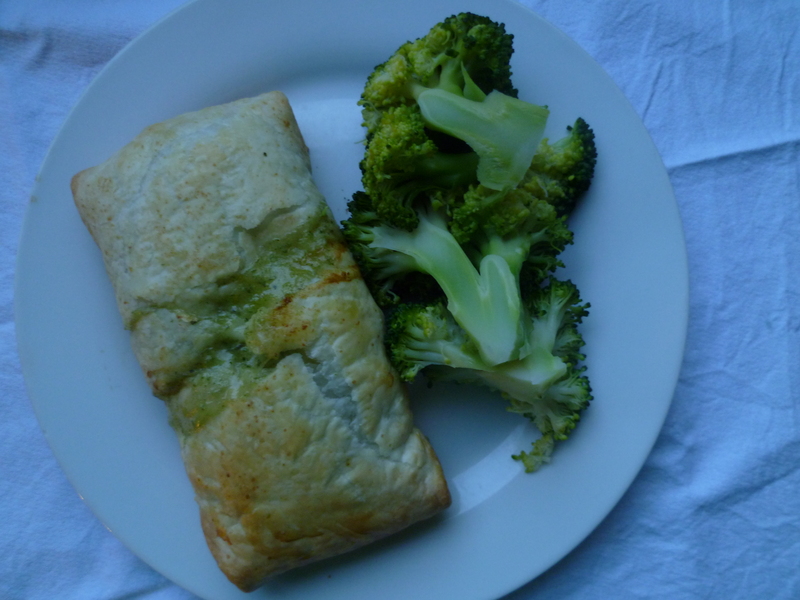 If you wanted to make smaller ones you could use filo pastry or chop up the pastry to make smaller parcels. 1.Heat the oven to 200 C fan bake. Defrost the pastry sheets by laying them out on the bench on their plastic sheets separately. 2. Steam the spinach leaves for about 3 minutes. Marvel at the tiny amount they have shrivelled up to! You need to get the excess water out – I press them into a sieve with the back of a spoon to do this. 3. Fry the chicken in the oil in a frying pan. 4. Place the creme fraiche/sour cream, tarragon and spinach in the food processor and blend together until all creamy. 5. Stir the chicken and anything else you want to add through the sauce. 6. Take a sheet of pastry an spoon some filling down the centre to make a long thin parcel. Use a third of the filling. Fold the sides in and use some milk to make it stick together. Fold the edges over and do the same. Place the parcel folded side down on an oven tray and brush with milk. Use a sharp knife to make 2 or 3 small slashes in the top to let steam and pressure out. Repeat to make a total of 3 parcels. 7. Cook in the oven for 20 – 25 mins until pastry is puffy and golden. Serve with veges on the side. This is a very quick and tasty dinner which doesn’t require hours of marinading beforehand. I served ours with some lightly toasted turkish bread. 1. 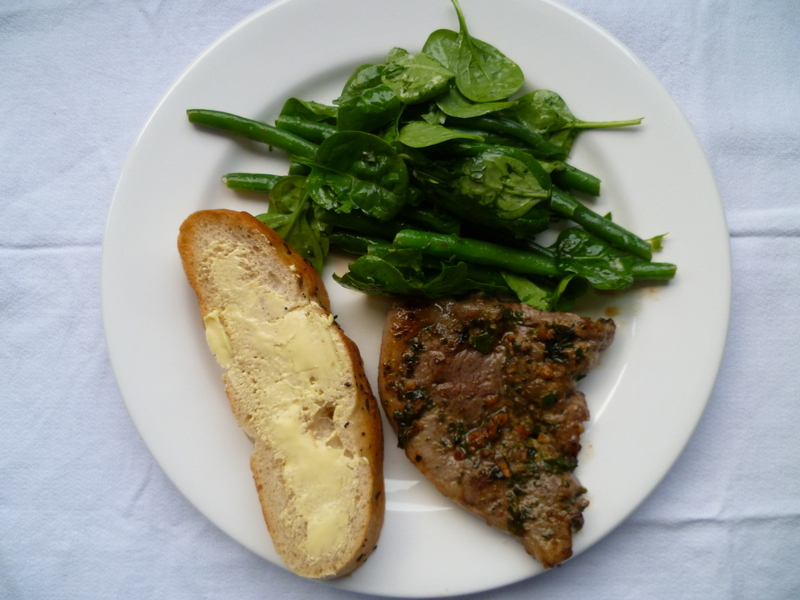 Mix the pesto and olive oil together and spread over both sides of the lamb steaks. Leave to stand while you prepare the beans. 2. Top and tail the beans. Lightly steam them – for about 3 mins. Put in the fridge to cool. 3. Heat the frying pan. Fry the lamb steaks on both sides to medium-rare or whatever your preference is. 4. To finish off the salad, take the beans out of the fridge. Add the spinach. Mix the lemon juice, olive oil and garlic together. Toss through the vegetables to coat. 5. Serve the lamb with salad on the side. Kids: I just gave my kids the whole beans by themselves as a vegetable rather than the salad which they wouldn’t have eaten! I am always keen to introduce more vegetarian dishes into our diet. I was vegetarian, or almost vegetarian, for about 15 years, but then after becoming pretty anaemic in the process of having babies I introduced red meat back into my diet. There are still some forms of it that I don’t like, steak has most people drooling but it just makes me feel nauseous! I remember when I was vegetarian eating a chickpea and pumpkin burger several times from a gourmet burger chain and really enjoying it. This is my attempt to reproduce that. 1. Heat the oven to 190 C fanbake and once hot put the pumpkin in to cook for around 20 – 25 mins until cooked through. Cool slightly. 2. Once the pumpkin is in prepare the wedges. Slice the potatoes in half long ways and then into quarters. Cut each quarter into 2 – 3 wedges and pat dry with a tea towel. Place in a large bowl. 3. Mix the parmesan, chicken stock, flour, paprika, garlic and 1 measure of oil together in a small bowl. Rub all over the wedges in the bowl. 4. Preheat the oil in a large oven dish in the oven for about 5 mins. Put the wedges in. Turn them every 10 mins to ensure even browning and cook for around 30 mins until crispy and cooked through. Once the pumpkin is out of the oven you can turn it up to about 200 C.
5. Place the 1 T oil in a frying pan on low – medium heat and add the chopped onion and garlic., Stir often until onion is soft. Add the curry powder and cook for 1 minute. You can add more curry powder if your family’s palate likes things more strongly flavoured. 6. Place the bread in the food processor and pulse to crumb. Place half the breadcrumbs on a plate and leave the other half in the food processor. 7. Remove the pumpkin flesh from the skin and place in the food processor with the onion mixture, chickpeas and egg (half the breadcrumbs are already in there). Pulse to mix. You ideally want a few of the chickpeas to not be completely pulsed into the mix. 8. Form the mixture into patties and roll in the extra breadcrumbs. Shallow fry in oil until golden on both sides. 9. To serve the burgers place the buns on an oven tray cut in half (not quite the whole way through) with the cut side up. Place a slice of cheese on one side. Grill in the oven until slightly golden and warmed. 10. 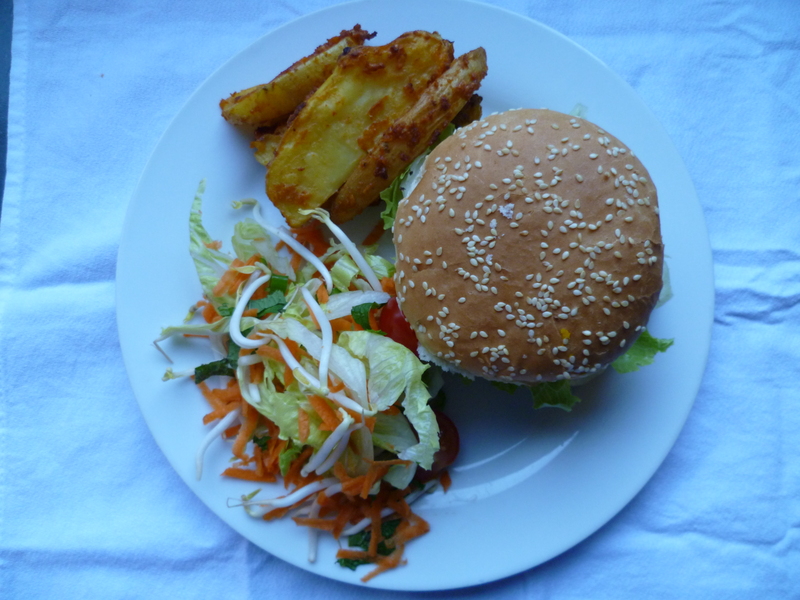 Place a piece of lettuce on each bun, top with the patty and anything else you want to put in your burger. Serve with the wedges and a salad on the side. 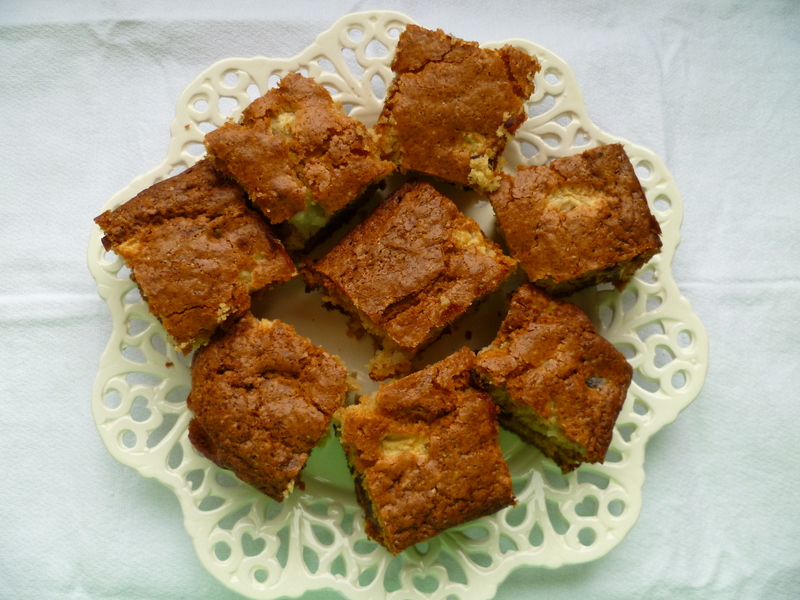 I was not intending to include a huge number of baking recipes in this blog, but I do like to bake! I have lots of favourite recipes which need to be stored somewhere before the ancient pieces of paper they are written on disintegrate. 1. Turn the oven to 180 C and grease and line a 20cm square tin. 2. Cream the butter and sugar together. Add the egg and beat to mix. 3. Fold in the flour, baking powder and baking soda. 4. Fold in dates, feijoas and milk to make a stiff batter. 5. Spoon into greased tin and bake for 45 minutes. 6. Serve dusted with icing sugar if you want to make it look pretty! The most time consuming part of these is boiling the potatoes or kumara. I chose to do this before work to ensure they were on the table quickly! 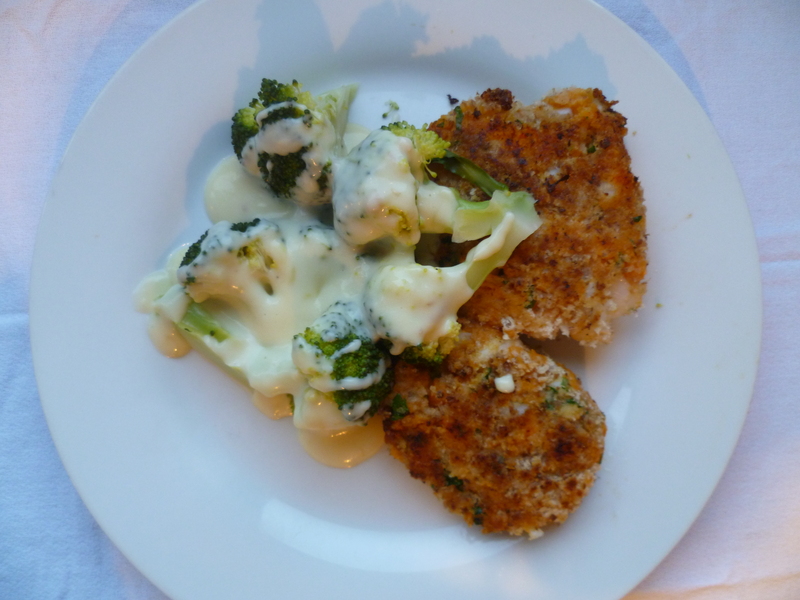 Serve with a salad or hot vegetables (we had broccoli and cheese sauce), and tomato, sweet chilli or tartare sauce on the side. 1. Boil and mash the potatoes or kumara. 2. Heat a small amount of oil in the frying pan on medium heat, and lightly fry the fish on both sides. 3. Flake the fish and mix with the mashed veges, egg, lemon juice and rind and parsley. Place the breadcrumbs on a plate. 4. Heat some more oil in the pan. 5. Shape a small handful of mixture into a flat patty – around 2 cm thick. Roll in the breadcrumbs and fry in the hot oil on both sides until golden. 6. Repeat steps 4 and 5 until all the mixture is used up. 7. Serve the fish cakes with vegetables and sauces.